Pet allergy symptoms may occur when your animal’s immune system becomes intolerable to an allergen. While many substances in the environment pose no threat to most animals, some pets experience a reaction after ingesting, inhaling, or coming in physical contact with certain things. Like people, sometimes pets may exhibit respiratory symptoms with sneezing, coughing and watery eyes. However, more commonly we see skin irritation. 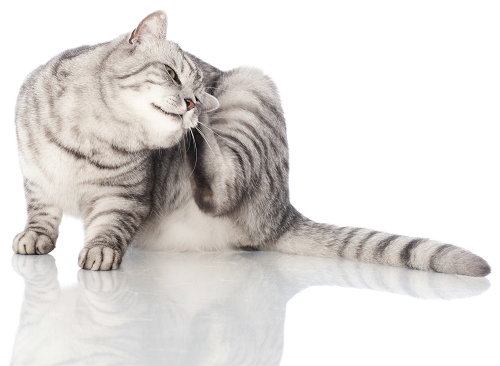 Redness, whelps, and even sores can develop and cause the pet to scratch and/or lick themselves. Irritated and broken skin also becomes susceptible to bacterial or yeast infections, which often produces hair loss, crusting, and scabbing. They can also develop symptoms concerning the digestive tract causing lack of appetite or loose stool. When you notice persistent symptoms, please call our office to schedule a consult with Dr. Whitworth. Whitworth Animal Clinic diagnoses and treats pet allergies and offers allergy testing. Determining the specific allergen requires a blood test sent to the laboratory to determine your pets reaction level to allergens that are common here in our area and also foods. A pet allergy related to food may require a dietary change in order to control symptoms. Airborne: Cigarette smoke, perfumes or aerosol products may cause asthma or bronchitis. When a substance is inhaled, the lungs become inflamed and irritated, which causes excess mucus production. Refrain from smoking in the house or using aerosols that cause respiratory or topical irritation. Dust or Dander: Vacuuming pet areas weekly and home interiors twice weekly help keep dust and dander levels to a minimum. Washing bedding (if possible) will be beneficial also. If sensitive, consider using fragrance-free detergent. Insects: When fleas pose the problem, a control program that eliminates the pests not only on the animal but also on interior surfaces becomes necessary. If over-the-counter products do not provide sufficient results or cause irritation, Dr. Whitworth often prescribes better alternatives. Seasonal: If pollen causes a problem; your pet may require preventative medications and limited exposure outdoors in the spring and fall. Initially, Dr. Whitworth may prescribe antihistamines, oral steroids or topical treatments that provide symptomatic relief from common pet allergy problems. Skin infections secondary to chronic irritation often require antibiotic therapy. Certain pets may require long-term treatment. Whitworth Animal Clinic can help you with maintenance treatment that is going to provide the best management for your pet’s allergies. If necessary, we have a dermatology specialist who comes to the Huntsville area for referrals. Pet allergies can be problematic. If your pet has an allergy, he is NOT living his best life. Call Whitworth Animal Clinic to set up an appointment to see what can be done to help your pet. Our clinic serves Madison and the surrounding communities of Decatur and Huntsville.